Family is paramount in understanding the cultural, racial, traditional, tribal, ethnical and religious differences that exist between human beings. How is this so? The Culture, Race, Tradition, Tribe, Ethnic Group and Religion of a person is determined by one’s Family. It is through the providence and grace of God however, that we were born into the family we belong to. Since we are ultimately a creation of God, our creator has placed us into a family that is best for our personal development and evolution. We practice the religion of our parents from childhood, we grow old in it, and it will become very difficult for us to depart from it. 1) Family – A group consisting of one or two parents and their children. Another definition says, a group consisting of one or two parents, their children, close relations and extended families. Family is also defined as the people who are related to each other including those who are now dead. 2) Religion- The belief in the existence of a god or gods and the actions that are connected with the worship of them. Types of religion include Islam, Christianity, Buddhism, Hinduism, Judaism, Sikhism, African Traditional Religion, etc. 3) Race – One of the main groups that humans can be divided into according to their physical differences, e.g. colour of their skin, Caucasian/ Mongolian race. Race can also be defined as a group of people who share the same language, history, culture, etc. e.g. Nordic races. 4) Tradition – A belief, custom or way of doing something that has existed for a long time among a particular group of people, e.g. religious tradition, cultural tradition, literary tradition etc. 5) Culture – the custom and beliefs, art, way of life and social organization of a particular country or group, e.g. European culture, Islamic Culture, American culture, etc. 6) Tribe – a group of people of the same race and with the same customs, language, religion, etc., living in a particular area and often led by a chief, e.g. tribes living in remote areas of the Amazonian Rainforest. In Nigeria, we have the Igala, Hausa, Igbo, Yoruba tribe, etc. We are born into this world through our parents with God’s authority and permission either by copulation or artificial insemination into a particular family. We carry the combined DNA and Genotype of our parents. Irrespective of the Phenotypes, our DNA and Genotype can equally be traced to our parents meaning that no matter how hard we try, we cannot deny the family we emanate from. The DNA of our parents is linked to that of our grandparents and that of our grandparents can also be linked to that of our great grandparents. This is how the lineage continues and in the end we discover in the tracing of our genealogy that we are all connected to one another irrespective of our Religion, Culture, Race and Ethnicity by family because these parents and grandparents might be from a different race, culture or religion. For example, a Nigerian man may marry a German lady and the male offspring may marry an Arabian woman, the woman may marry into yet another culture, and so on and so forth, and infinitum. You can clearly see that as we humans are inter-marrying, we are generating extended families outside a particular race, ethnicity, culture and tradition. If this link of parents to grandparents and to great grandparents is traced to our origins, you will see that it leads us to the concept of the first man on earth (Adam) and the first woman on earth (Eve).They were the first parents on earth. Since our human lineage can be traced down to them, it means we are all related to one another irrespective of any religion, race, ethnicity, tradition and tribe by family. Our first father (Adam) as we have come to understand through the reading of Bible was created in God’s image. God formed Adam from dust and breathed into him the breath of life. According to Islamic religion, Allah (God) also created Adam from dust and He commanded all his Angels to bow before Adam; the devil (Iblis) refused to obey and God punished him by casting him away from heaven. If God could order his Angels to bow before Adam, don’t you think God has high regards for man? Other religions too have their own concepts and beliefs on the origin of man. Do you know Adam’s Religion, Race, Culture, Tradition, Ethnicity and Tribe? Some might say Adam was a Christian because they are Christians. Muslims might argue that Adam was a Muslim because they are Muslims. And the Jews might claim Adam practices Judaism because they are Jewish. You may want to ask yourself this question that if these different religions each have their view on Adam, which of them do you think is valid and correct? The bottom line in all this is that our first parents, Adam and Eve were created by God and they believed in God. They worshiped and glorified their God in their own way. Even after they sinned God forgave them because He loves them. Adam and Eve sinned and God that created them could not kill them, not because he cannot kill them but because they were His creation. There are many people in the world today who justify the killing of someone in the name of Religion. Whenever you take the life of another, you are disobeying the word of God and you are indirectly killing God’s creation and stealing away God’s breath in that person. How can the killing or forcing of another person to follow your own religion be justified as honourable to God? How can you know that you are on the right path? God, in one of his Ten Commandments to man through his servant Moses commanded that “Thou shall not kill.” Judaism, Christianity, and Islam faiths all believe in this commandment. Hinduism, Jainism Sikhism and Buddhism consider killing a sin as well. As I come into this understanding of our creation, I cannot help but wonder and question why so many believers in God’s word fight and kill over religion when the family that God created them into determines their country, race, culture, tradition, ethnicity and religion. Demographic research of populations shows that 95% and more of people grow up to practice the religion of their parents. Why do you consider these people who do not practice according to your particular faith to be non-believers and non-followers of God? One thing is certain in all this, these people that you are killing did not create themselves into that family they belong – God did. God in his own sense and wisdom created them into that family, race, tribe ethnicity, tradition and religion. Remember our God is the Omnipotent, Omnipresent and Omniscient God because He has power, He knows and sees everything. Do you now consider yourself wiser and superior to God that you feel they were not meant to belong in that religion into which they were born and raised? Do you, as a mere being questions the super-natural being, wisdom and grace of God? If you kill or argue with them, you are questioning God’s plans for their lives because it was God that created them into that family. Their family has provided them with a path to follow and they will grow old in that path, so you can’t just expect them to abandon that path and accept to follow your path only because you feel they are sinners or going to hell according to your own faith. Consider again carefully the following scenarios: a German father and a German mother produce a German offspring and an offspring from an Arabian parent then kill the German offspring because he is not from Arabia; a Christian fighting or criticizing a Muslim because he is not Christian; a Buddhist fighting a Jew because he is not a Buddhist; a Jew fighting and criticizing a Christian because he or she does not practice or believe in Judaism. Muslims justify the killing of Christians because they believe Christians are not worshipping God in the right way. Another common occurrence is one where a Christian mother will say to a Muslim man that my daughter will not marry you because you are not a Christian, or vice versa. We are all fighting, criticizing and killing other people practicing their religion because we feel ours is the best, right and only way to serve and worship God. Why is this? Like those practicing the African Traditional Religion will always say, “the gods are not men so they make no mistakes.” We all know our God to be a perfect God so why do we doubt, fight and struggle against his creation and the family HE created these people into? In the practice of our religion and faith we must learn to live in peace with our brethren and not force religion into our daily fights and arguments. There are many people who hide under the umbrella of religion for the sole purpose of perpetrating their evil activity. Political and social life has turned our faces away from our religion. It makes people fight, quarrel and kill each other forgetting that all religions in their foundation teach peace and tolerance. The people of Adumu (from the story in this book) have their own religion, they believed in their grand-gods long before the missionary came with their own way of worship. 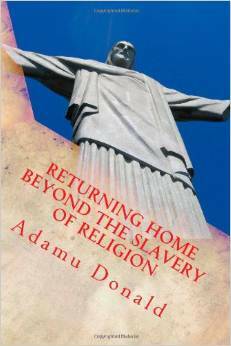 The missionaries came preaching against the religion of the Adumu people, their customs and traditions. Some of the people in the village became angry because the missionary said their gods were dead and could not answer their prayers. The people of Adumu see this talk as foolish talk because their grand-gods had been answering their prayers long before the missionaries came to the land. How can anyone expect such person to abandon his tradition and culture, a tradition they were born into, the ways of worship they have learnt from childhood now that they are already old in the practice? “We were not doing badly in the village before they came with their religion,” Ayegba said to Adah when the life of his son Ocholi was in danger after he refused to perform the sacrifice the gods had asked him to perform, (From the story in this book). Some of the villagers became angry because the missionaries were criticizing their almighty grand-gods. They had wanted to burn down their houses and chase them away from the community but the king urged them to embrace peace. “We must not be the ones to fight for the grand-gods,” he told them. The king admonished them to be calm and not resort to violence. They listened to him and development came to the land. The missionaries were able to teach the people how to read and write in another language. Some of the villagers embraced Christianity and they live happily with the other ones that still followed the preaching of the grand-gods. Ocholi, an inhabitant of Adumu land benefited greatly from the missionaries. He achieved success in the city through thick and thin with the maximum protection from his grand-gods. The grand-gods of his land chose him to serve in their shrine as a priest. Some people might feel Ocholi should not go to the village to serve as a priest because their religion forbids it, and some might say Ocholi should go and serve the grand-gods because they had protected him all along. Will Ocholi go to serve his community as a priest? Read the story and find the reasons why you think Ocholi should not go to the village or whether he should go to serve as a priest. Don’t judge him right away. Two more questions that need answers are – who are we to judge another person? What right have we to judge that person? Before you judge if Ocholi should go to the village or not, find out about the village and what the gods have done for him. We should all strive to live in peace and harmony irrespective of our family, ethnicity, tribe, culture, race, religion, etc. for the development of our villages, town, cities, states and countries. We are all created by God and we should not be fighting, criticizing and killing each other over a religion and culture we grew up to know and the one our family helped us to determine. If only one knew his religion before they gave birth to him/her, only then can he/she claim the superiority of his religion over another. Let us all embrace peace and love one another.